National Instruments Oceania has announced the participating teams for the annual National Instruments Autonomous Robotics Competition, a student robotics competition designed to encourage development and innovation in the field of robotics. A total of 24 teams will be participating in this year’s NI ARC, representing top universities from across Australia and New Zealand. The competition, which commences in April and concludes in September 2012 will involve each team developing an autonomous robot that will ultimately compete in a live competition with the objective of autonomously completing a set of predefined tasks in the shortest amount of time and earning the most points. The theme for the 2012 NI ARC is ‘Search and Rescue’. “The NI Autonomous Robotics Competition is an exciting initiative which provides engineering students with an excellent platform to develop and showcase their technical and creative skills and capabilities” said Matej Krajnc, Managing Director for National Instruments Oceania. “There were some amazing robot designs in the 2011 competition, and with twice as many teams participating this year we are looking forward to a challenging, competitive and highly enjoyable 2012 Competition”. The students, working alongside NI engineers, will get the opportunity to showcase their robotics talents in front of a large audience from industry and academia at the live competition on 21 September 2012. Within the theme of ‘Search and Rescue’, the robotics application areas of focus will be navigation, obstacle avoidance, and object handling. Participating teams have each received a development kit featuring an NI CompactRIO embedded acquisition and control system and the NI LabVIEW 2011 Robotics Suite for the development of their autonomous robot. Maxon Motor is a proud sponsor of this event and has also provided each team with a gift voucher for purchase of Maxon Motors. The winning team at the live national competition on 21 September 2012 will receive $3,000 cash, and the runners up will be awarded $1,500 courtesy of National Instruments Oceania. There is also a cash prize for the most aesthetically pleasing robot. Additionally, all teams that successfully complete the tasks in this competition, regardless of their finishing position, will get to keep their development kits valued at over $26,000. Training, mentoring, and competition objectives will be provided by NI Application Engineers who specialise in robotics applications. The 2012 NI Autonomous Robotics Competition (NI-ARC) builds upon the inaugural competition held in 2011. When it was introduced many years ago, the GP 16 A planetary gearhead represented a milestone in gear technology, thanks to its use of powder metallurgy. Now, in the new GP 16 C, ceramic components are also used. Longer life span and a doubling of the continuous torque fulfill the requirements of many customers. The newly developed planetary gearhead with a 16 mm diameter transmits up to 600 mNm under continuous load and can even achieve close to 1 Nm for short durations. These are twice the values offered by the previous version, an improvement which can be almost entirely traced back to the ceramic axes. As demonstrated in more than a million cases, the high-tech, in-house manufactured ceramic components significantly improve the wear characteristics of critical components. After the same amount of running time, ceramic axes show almost no signs of wear, while steel axes show a high degree of abrasion. Planetary gearheads with ceramic axes offer significantly higher torques than those with steel axes. In the case of the new GP 16 C gearhead, it was possible to increase the recommended maximum motor speed from 8,000 to 12,000 rpm. This gearhead is part of the modular system and is available with one to five stages and with a total of 20 different reduction ratios, from 4.4:1 up to 4592:1. The available reduction ratios are thus identical with the existing A version. The maximum continuous torque of the one-stage version is 200 mNm; the five-stage version features 600 mNm. The short-term torques are 300 mNm and 900 mNm respectively. Thanks to preloaded ball bearings, the tempered, rust-free output shaft has no axial play. The mounting has been improved and now has six M2 threads on a pitch circle diameter of 13 mm. The GP 16 C gearhead can be combined with seven different maxon motors. With the various motor windings and the 20 different reduction ratios, this provides a wide range of combinations. In addition, the dynamic maxon motors can also be equipped with sensor systems (encoders) and various 1- and 4-quadrant controllers as well as positioning controllers are available for the motor control. The field of application is wide and extends from precision-engineered devices to battery-operated tools, from medical technology to the aeronautics industry. maxon motor, the worldwide leading provider of high-precision drives and systems, presents a new, more powerful series of planetary gearheads, called GP 26 A. The GP 26 A closes the gap which previously existed between the 22 and 32 diameters in the range of power-optimised gearheads. The GP 26 A offers all of the advantages of the maxon series of gearheads, including modularity, precision and power. Particularly significant improvements over the previous generation are the higher permissible loads. The gearheads are developed and manufactured by maxon motor. The following features in particular are responsible for the power increase: the integration of a robust, preloaded ball bearing, optimised gearhead geometry, the high permissible motor speed, and the optimised dimensions of the output shaft. This gearhead is part of the modular system and is available as one-stage to three-stage versions, with a total of 9 different reduction ratios, from 5.2:1 up to 236:1. The maximum continuous torque of the one-stage version is 0.75 Nm and of the three-stage version is 4.5 Nm. The short-term torques are 1.1 Nm and 6.2 Nm respectively. Thanks to preloaded ball bearings, the tempered, rust-free output shaft has no axial play. Within the renowned maxon modular system, the new GP 26 A gearhead can be combined with five different motor types. Combining these gearheads with dynamic maxon motors as well as sensor systems (encoders) results in powerful drive units. For the control functions, various 1- and 4-quadrant controllers as well as positioning controllers are available. The field of application is wide and extends from precision-engineered devices to battery-operated tools, from medical technology to industrial automation. The spindle drive program will be extended with the new size 16 mm. This is also an easily configurable complete system with integrated axial bearing for high loads. Version with metric M6 spindle or Ø 5 mm ball screw. In mechanical engineering, it is often necessary to find a solution for converting rotary motion into powerful linear motion. Precision spindles combined with DC motors make it possible to transform rotary motion into axial motion. Gearheads, motors, encoders and controllers from maxon’s standard program are used to drive the spindles. The individual components of the spindle drives are perfectly matched to each other, resulting in high-efficiency drive solutions. Contrary to the spindles of the larger GP 22 S and GP 32 S, the spindles of the GP 16 S are rolled. This results in a lower price. A central component is the axial bearing, which must withstand the high tractive and compressive forces of the spindle. Important characteristics for the ball screw are high efficiency, high load capacity and no self-locking. Noteworthy features of the metric spindle are the self-locking function and the lower price. The spindle drive program in the sizes 22 mm and 32 mm has now been extended to include the smaller GP 16 S version with a diameter of 16 mm. For the planetary gearhead, 14 different reduction ratios are available, from 4.4 up to 850:1. Depending on the reduction ratio and the type of spindle, this makes it possible to achieve feed forces between 35 and 370 N and even up to 400 N for short durations. DC or brushless EC motors can be used to drive the system; in total, nine different motor types are available. 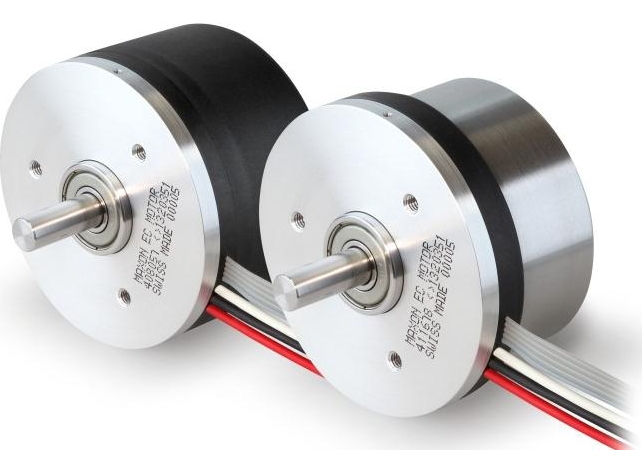 These motors can also be equipped with compatible sensors (encoders), which are essential for precise positioning. EPOS positioning controllers are recommended for controlling the motor-sensor combination. These controllers feature a wide range of functions as well as CANopen or EtherCat. The controller can directly evaluate limit switches and other sensors. The programmable EPOS P version makes it possible to set up independent, standalone systems. maxon motor’s expertise in drive technology is reflected in the entire selection of components. The spindle drives feature robustness, flawless operation and a long service life. The EPOS family continues to grow. Besides EPOS2 with its extremely successful and versatile CAN bus, maxon motor now offers with the EPOS3 70/10 EtherCAT a positioning controller that communicates with the standard protocol EtherCAT, the prevalent industrial Ethernet fieldbus. The digital positioning controller EPOS3 70/10 EtherCAT meets the highest demands in real-time positioning of synchronised multi-axis systems. Extremely compact in size, the EPOS3 possesses a wide nominal power supply voltage range from 11 to 70 VDC and delivers a continuous output current of 10 A, during acceleration and deceleration even up to 25 A. Designed for DC and EC motors with a power range up to 700 Watt, it provides out-standing uniform running for motors equipped with incremental encoders. 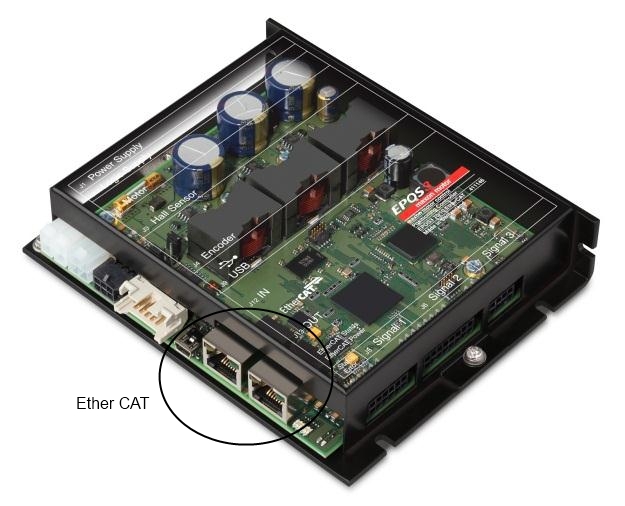 The EPOS3 70/10 EtherCAT easily integrates as slave into real-time EtherCAT protocol-based Ethernet networks, and, with the provided device description file and device-specific configuration guide e.g. in a Beckhoff-TwinCAT environment. A multitude of operating modes allows efficient, flexible use in a wide range of drive systems in robotics, automation, and mechatronics. The positioning controller supports a broad bandwidth of encoders. In the typical EtherCAT modes «Cyclic Synchronous Position (CSP)», «Cyclic Synchronous Velocity (CSV)», and «Cyclic Synchronous Torque (CST)», the EtherCAT master calculates the trajectory points and sends the target parameters cyclically and synchronous via EtherCAT network to the EPOS3. Thereby, the corresponding control loops for position, speed, and torque/current take place in the EPOS3, which, in turn, delivers the measured actual values (position, speed, current) to the EtherCAT master. For the actual drive control, the EPOS3 70/10 EtherCAT is equipped with superb motion control functionality. For example; in «Profile Position Mode (PPM)», the calculated path is being followed highly dynamic and with high accuracy. A bundle of additional features, such as speed control with given target velocity in «Profile Velocity Mode (PVM)», «Homing» to a defined mechanical position using numerous implemented methods is available. The same applies for the generous number of inputs and outputs, which makes the extra EtherCAT I/O module obsolete. Digital inputs/outputs (11/5) can be configured as reference or limit switch as well as Capture or Trigger, or can be used to activate holding brakes with definable ON/OFF switching delays. Additionally, analogue inputs/outputs (2/1) are at free disposal. Perfectly tailored for servo motors, the EPOS3 70/10 EtherCAT offers likewise built-in motor filters with motor chokes for EMC-conform operation. Prefabricated cables and perfectly matching accessories help to make installation and commissioning easy. The controller offers comprehensive circuitry against overcurrent, excess temperature, undervoltage and over-voltage, against voltage transients and against short-circuits in the motor cable. Furthermore, it is equipped with adjustable current limitation to protect motor and load as well as protected digital inputs and outputs. The EPOS Studio serves as user interface for efficient parameterisation employing a lot of smart and clever functions and intuitively designed Wizards. Tasks, such as, Firmware download, automatic controller commissioning, I/O configuration, test & data recording becomes little more than child’s play. Alternatively to the Ether-net interface, a USB 2.0 port is available for commissioning and diagnostics. maxon motor Group enhances its global network with its own sales company in Austria. The worldwide leading provider in precision drives and systems is integrating its long-time sales partner, Kwapil & Co. GmbH, into the maxon motor Group. With this step, maxon motor is further strengthening its presence in Austria. Since Kwapil was founded in 1975, the company has enjoyed success in the distribution of drive technology and electronics. Under the management of electrical engineer Kurt Kwapil, the company has specialized in providing its customers with optimized, custom-manufactured drive solutions. maxon motor is convinced that by bringing Kwapil into the corporate group, it will be able to expand its market share in Austria, where the level of customer support plays a particularly critical role: “The drive technology sector is very dynamic. In Austria, we will now be even closer to our customers and have additional flexibility in catering to their needs,” explains Eugen Elmiger, CEO of maxon motor ag. 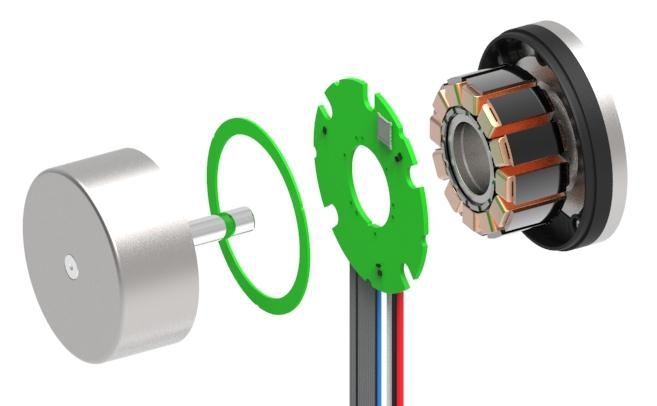 The engineers and specialists at Kwapil are closely familiar with maxon’s wide product range of brushless and brushed DC motors, gearheads, and control electronics. Since the 1980s, maxon motor and Kwapil have successfully cooperated in areas such as medical technology, industrial automation, and robotics. In addition to maxon products, Kwapil will continue to distribute its current portfolio of drive technology. With 15 sales companies and more than 20 contracted distributors around the globe, maxon motor is present on every continent. More than 2,000 employees work at maxon motor in the development, production and distribution of drive systems for medical applications, industrial automation, instrumentation and inspection, the automotive and aerospace industry, etc. The multitude of possible combinations makes the new EC 60 flat the ideal drive in a wide range of applications. Whether the focus is on high nominal torque, on high-dynamic positioning tasks with superb repetition accuracy, or on robustness and insensitivity against environmental conditions, the choice is all up to the end user. Versatility: Various windings for battery-powered and industrial applications, direct or belt drives, torque and repetition accuracy. Power: Nominal torque up to 319 mNm, almost non-existent detent of 7 to 12 mNm. Robustness: Radial load 100 N, protection class IP 54 (spray water), grounding connection directly at the flange, cable strain relief, environmental conditions of -40 to +100°C. The MILE encoder is used to make optimal use of the flat motor in high-precision applications and positioning tasks. Behind the abbreviation MILE hides Maxon’s Inductive Little Encoder, the worldwide smallest inductive rotary encoder. Its operating principle is based on the detection of high-frequency inductivity which generates eddy current in an electrically conducting target. High robustness towards dust or oil vapour thus making additional protective measures, such as a cover, unnecessary. Insensitivity against interference pulses (for example from PWM controllers or motor magnets). The EC 60 flat’s extraordinary characteristics come into full effect in battery-powered mobile applications, as well as in the industrial field; for example in variable flow valve drives, in dialysis systems, or in direct drive centrifuges with extended service life and large radial loads. The new EC 60 flat MILE is particularly ideal for use in applications demanding high torque and positioning tasks, as well as for high-precision variable speed setups. Designed for permanent magnet activated brushed DC motors and brushless EC motors with Hall sensors up to approx. 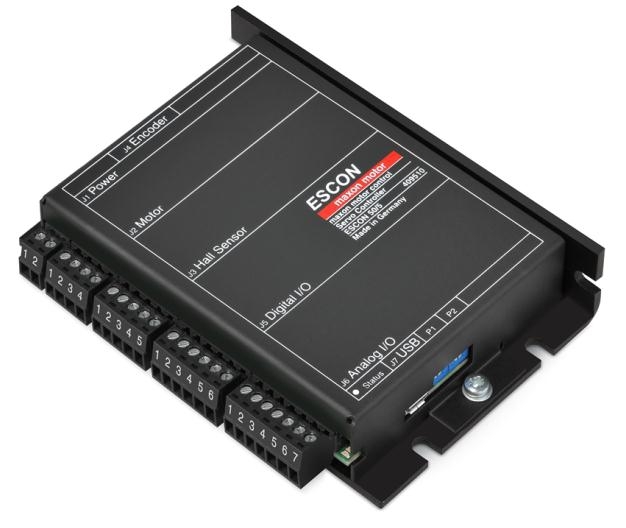 250 W, the new ESCON 50/5 has excellent control properties and a very fast digital current controller with an enormous bandwidth for optimal motor current/torque control. The drift-free yet extremely dynamic speed behavior enables a speed range of 0 to 150,000 rpm. The hardware provides a wide range of functions, with fully configurable digital and analogue inputs and outputs. It is perfectly matched to maxon’s range of motors and thus allows dynamic drive solutions that meet the highest demands. Furthermore it can be run in various operating modes (speed controller (closed loop), speed controller (open loop), current controller). The compact servo controller is controlled by means of an analogue set value. This value can be specified by means of analogue voltage, an external or internal potentiometer, a defined value or by means of a PWM signal with variable duty cycle. Other interesting functions are for instance the ability to enable or disable the power stage depending on the direction of rotation, or to use speed ramps for acceleration and deceleration. The speed can be regulated by means of a digital incremental encoder (2-channel, with/without line driver), DC tacho or Hall sensors. Top performance should not be a matter of practice makes perfect. Therefore the servo controller has been designed specifically with easy startup and user-friendliness in mind no in-depth knowledge of drive technology is required.When the servo controller is connected to a PC via a USB port, it can easily and efficiently be configured with the “ESCON Studio” graphical user interface. During startup and configuration of the inputs and outputs, monitoring, data recording and diagnostics, the user has access to a large variety of functions and is assisted by user-friendly software wizards, as well as a well-designed automatic procedure for fine-tuning the controller.On the hardware side, the ESCON 50/5 comes fully equipped with everything that is needed. For example, no additional external filters or motor chokes are required. The ESCON 50/5 features protective circuitry against overcurrent, excess temperature, undervoltage and over-voltage, against voltage transients and against short-circuits in the motor cable. Furthermore it is equipped with protected digital inputs and outputs and an adjustable current limitation for protecting the motor and the load. The motor current and the actual speed of the motor shaft can be monitored by means of the analog output voltage. The large range for the input voltage and the operating temperature allows flexible use in almost all drive applications, in automation technology, in small machine manufacturing and equipment engineering, and in mechatronics. With its exceptional efficiency of 95%, the ESCON 50/5 is a first-class choice for mobile, highly efficient yet consumption optimised applications.